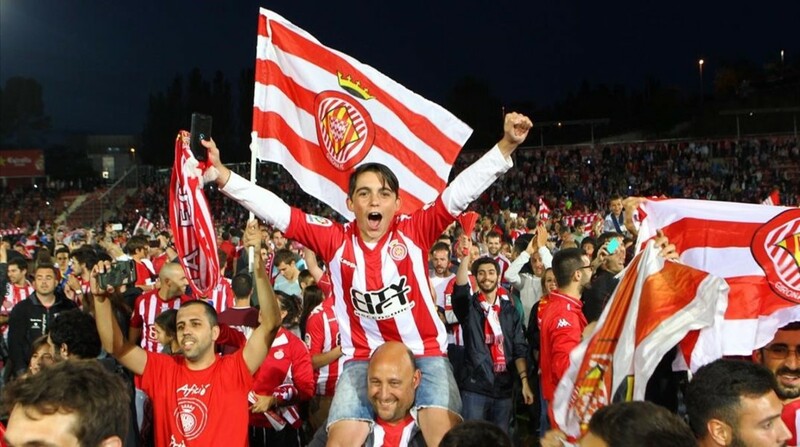 Our Fans View Series’ continues as Gerry Johnston speaks to Girona fan, @swaccountants about the their promotion to La Liga, the season ahead and survival. Girona finally won promotion to La Liga after going close in the last two seasons. How big was it for the club to eventually get across that line? It was massive. The club had gone so close in three of the last four seasons that to not do it this season, especially from such a good position in the spring, would have been demoralising for both club and fans alike. Pablo Machin, the head coach, has said he would have left had they failed this time and, although we overcame the loss of key players last summer (Lejeune and Becerra) another loss of star performers, such as Pere Pons and Alex Granell would probably have seen the side fall out of contention next season. It was also critical financially, the owners have propped up the club and improved the budget since taking over in the summer of 2015, but the previous owners had put the club 4.5m euros in debt, a legacy the club still has to repay each year. We were only one poor season, as in 2013/14 when only a late run of results avoided relegation, from slipping back into Segunda B, jeopardising the financial viability of the club. That threat is now gone. What are your thoughts on Pablo Machin? Is he the right man to keep the club in La Liga and build on what he has started over the last three and a bit years? Pablo Machin was a little known coach when he arrived, 2 mid-table finishes at Numancia, a club he had served as a player, doing nothing to suggest he would be the success he has been. He arrived late in the 2013/14 season with the club having cut the playing budget to that of the lowest in the league and seemingly heading to inevitable relegation. Not only did he mastermind the great escape but settled very early into the formation that has served us so well ever since, three solid centre-backs, good on the ball and not fearful of being pulled out wide, to cover two hard-working wing-backs who, particularly at the Montilivi, play as wingers more than full-backs. Since then he has been an unqualified success, only denied by a stoppage time equaliser in 14/15 from promotion despite still having a bottom three budget, to a play-off final in 15/16 and now promotion in 16/17. He has also shown himself to be his own man. This winter window he was given highly rated City left wing back, Angelino, but with the current wing-back Aday in good form, didn’t pick him. No doubt under pressure to select him, Machin held firm, and the player was moved on again before the window closed. He definitely deserves a chance in La Liga and, even if we fail to stay up, I would suspect he would still be retained to lead us back up again. Girona have lost more players than they have signed at this point. Is that a big concern and what do you think of those who have arrived? It does seem to be a feature of the Spanish league that promoted teams don’t trust the players that got them promotion to keep them up in La Liga. Alaves were a very good side in winning promotion in 15/16 yet signed 19 players last summer and, based on their first season back, appear to have been justified in that. It is a risk. Girona, it is fair to say, have probably played better than the sum of their parts. There are no real stand-out players and signings have been made in previous seasons to fit into the now well-developed playing style such that it works like clockwork. The introduction of better technical and flair players could easily disrupt that plan and it will be very interesting to see the type of players Girona sign between now and the start of the season and the formation adopted. The club state this big turnaround of players is a statement of intent and that they are not in La Liga just to survive. Realistically though there must be a good chance for any promoted side they will come straight back down and you do worry that we would then miss those players released for the job of bouncing straight back. As for players so far, the signings have been modest, two goalkeepers, the experienced Basque, Gorka Iraizoz, Barca B’s Jose Aurelio, and the ex-Sporting and Middlesbrough centre-back, Bernardo. You would expect a significant step up in quality and numbers for new signings between now and the season starting with a lot of help from their partners, Man City. We have been linked with about 30 players and counting! From Catalans playing abroad, Bojan and Muniesa (at Stoke) etc, to City academy players, Aleix Garcia, Brahim Diaz, Paolo Fernandes etc, to players identified by Man City, Moreno (on loan at Depor last season), to experienced La Liga campaigners, Mikel Rico (Athletic) and Viktor Alvarez (Espanyol). Who knows who we will end up with but Sporting Director, Quique Carcel, has proven very capable in the transfer market previously albeit operating at a very different level to now. However he has support from agent, Pere Guardiola and the City scouting network. For me the key is finding a striker. This was probably our weakest position last season with attempts to strengthen in the winter window thwarted and chances in La Liga will be much harder to create so a goal scorer is a must. Still only 17 but I would love to see Brahim Diaz from the Man City Academy. He has been identified as a special talent since he was discovered by Malaga who promised he would be “playing in La Liga when he’s 16” if he stayed. He didn’t and City saw off every big club in Europe to secure his signature as a 14 year old. Attacking midfielder, City fans who have seen him say he is still looking like a very special talent. Is there anyone in the squad that you are concerned might be tempted to move away from Girona? As I said earlier, we are more the sum of our parts than individually brilliant. I would have expected Pere Pons to leave if we had not been promoted. He is a hard-working holding midfielder with a buy-out clause of 2m euros. However, as a local lad idolised by the Girona fans I can’t see him leaving now. Another key player that I expect to make the step up and has just extended his contract is attacking midfielder, Portu. I wouldn’t want him to leave. Similar to last season, the club will have a training camp at the fantastic Manchester City facilities in late July. This is particularly fortunate this summer as Girona’s own Montilivi ground is undergoing a major overhaul ready for La Liga. While in England they will play League 1, Oldham Athletic, and championship, Nottingham Forest. On their return they have a friendly lined up against Premiership new boys, Brighton & Hove Albion, on the coast at Palamos (due to the work at Montilivi) and a short trip to play Nastic in a local derby. I suspect the side will have a youthful look to it but that will be due to the City academy boys. Girona have not had the infrastructure to develop their own talent ready for such a step up but they are looking at changing this, having recently given local side Peralada official B-team status and paying for their promotion to Segunda B. What are Girona’s targets for next season? 17th and to see their own players develop into La Liga performers forming the core of the squad going forward rather than relying totally on loan talent. Players such as Pere Pons, Borja, Granell, Alcala, Ramalho and Juanpe will, hopefully, show they are able to perform at the top level.